Around the holidays I’m about as gleeful as a child. Friends and family, excuses to make yummy food — what’s not to love? Thanksgiving snuck up on me this year. I’ve been working so hard at my full-time job lately that I haven’t had much time to prepare. But I did manage to develop this recipe just in time, and I’m excited to share the pan I made today with my friends after our group yoga practice tomorrow morning. I am supremely lucky to practice yoga each day with some of the most beautiful people I know, and I’m not talking about physical beauty, although that is also true… It’ll be an honor to share this treat with them. What better way to start a day dedicated to life’s joys and gratitude? 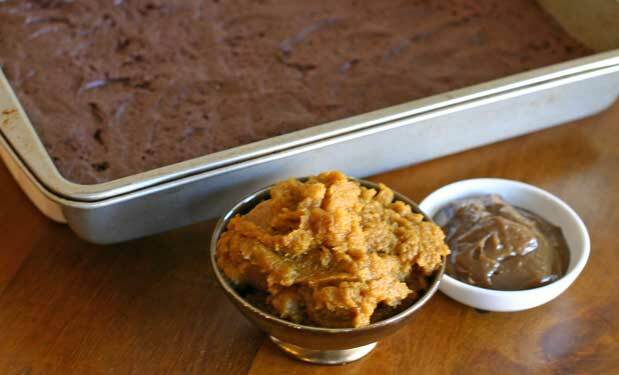 Puree the soaked dates, and separate the puree into 1/4 cup for the pumpkin layer and 1/3 cup for the brownie layer. Preheat the oven to 350°F and generously grease a 13 x 9-inch pan with coconut oil. Now we’ll work on combining the ingredients for the pumpkin layer. 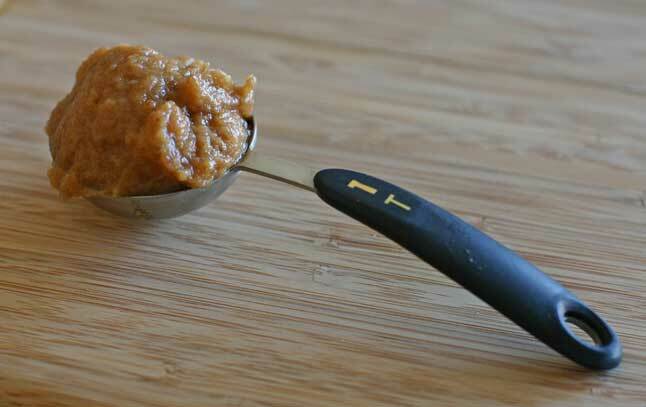 In a small bowl, mix together 1/2 cup pumpkin puree, 1/4 cup date puree, 1 T. brown rice syrup, 1 tsp. melted coconut oil (warm it in a pan over very low heat), 1/2 tsp. vanilla extract, 1/4 tsp. cinnamon and 1/4 tsp. allspice. Stir thoroughly until you have a homogeneous mixture. Set aside. For the brownie layer, we’ll start with the wet ingredients. 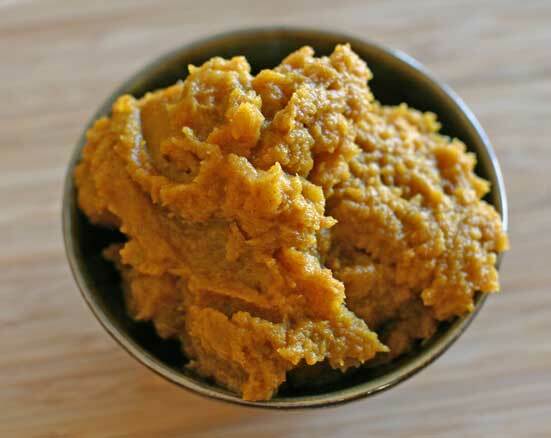 In a medium bowl, combine 1/3 cup date puree, 1/4 cup pumpkin puree, 1/4 cup maple syrup, 3 T. melted coconut oil, 1 tsp. vanilla extract, 1/4 cup almond milk and 1 T. ground flax seed. Set aside. 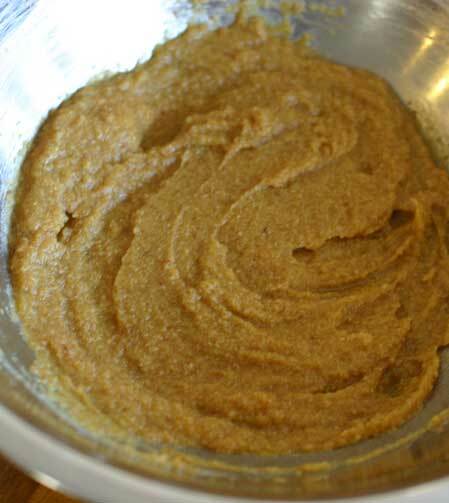 In a separate larger bowl, combine the dry ingredients: 1/4 cup almond flour, 1 cup spelt flour (all-purpose flour will also work), 1/3 cup cacao powder, 1/4 tsp. sea salt and 1/2 tsp. baking powder. Set aside. Now it’s time to melt the chocolate. If you have a double boiler, use that. 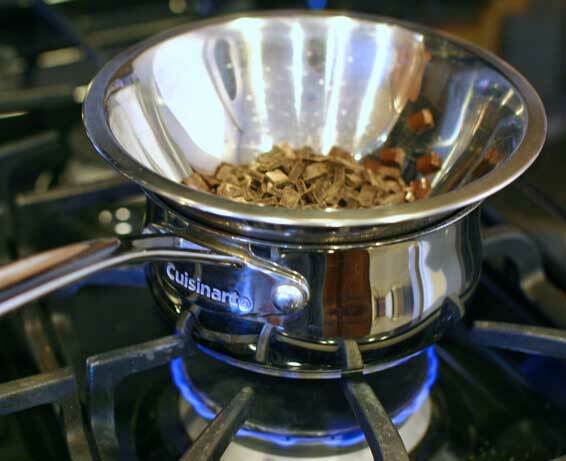 A double boiler is essentially two stacked saucepans. You boil water in the lower pan and the steam from that one heats the upper pan. This system is used for melting chocolate because it is delicate and if we used only one pan, the heat from the burner could scorch it. If you’re like most people, you don’t have one. I don’t either. Instead, I use a small saucepan and a heat-proof bowl that’s wide enough to cover the pan without touching the bottom. Once the water in the lower pan is boiling, add the chocolate chips to the upper pan or the bowl. 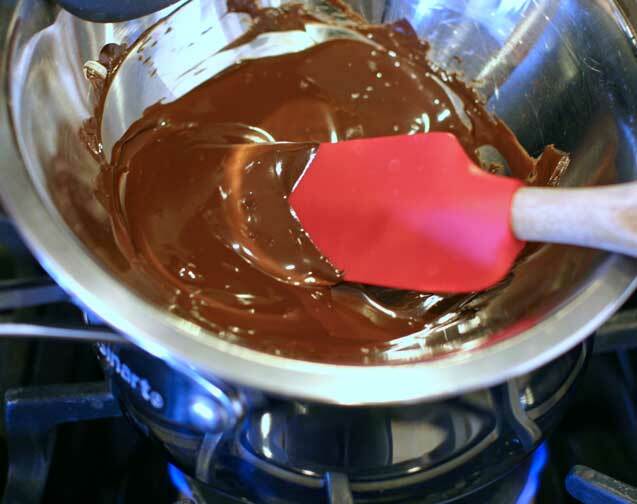 Hold the bowl with a potholder — it will get hot — and continually stir the chocolate until it’s melted. A little patience, and the chocolate will be smooth as silk. 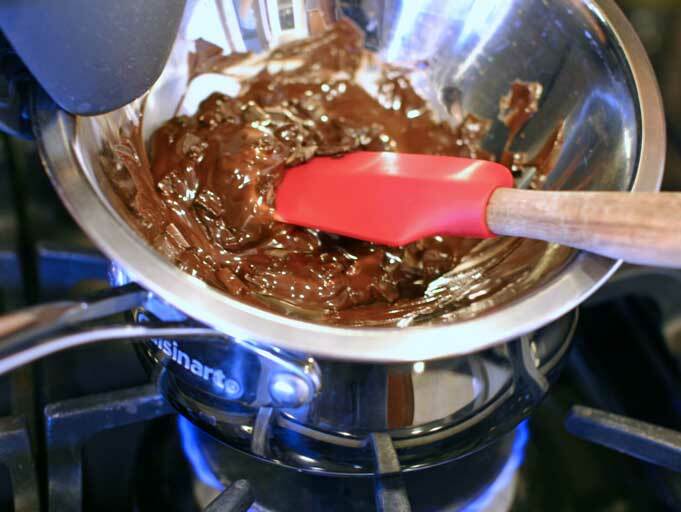 Pour the melted chocolate into the bowl of wet ingredients and stir to combine. Next, add the wet ingredients to the dry ingredients and mix thoroughly. 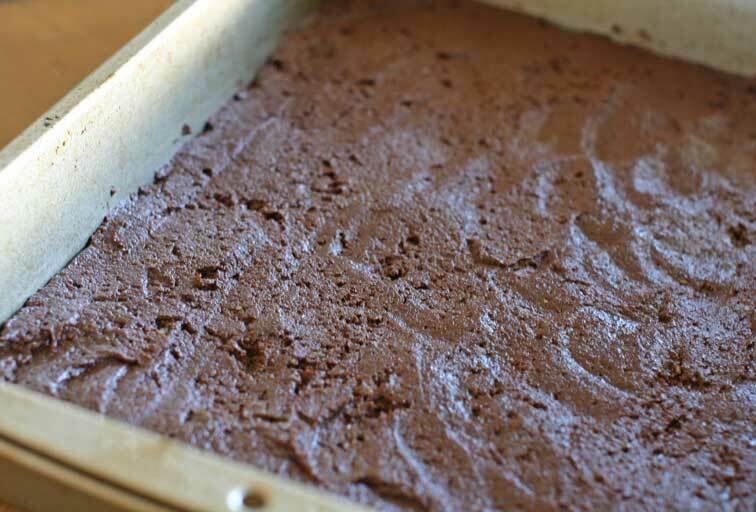 Then spread the brownie layer into the bottom of the prepared pan as evenly as possible. Now we’re ready to apply the pumpkin caramel topping. 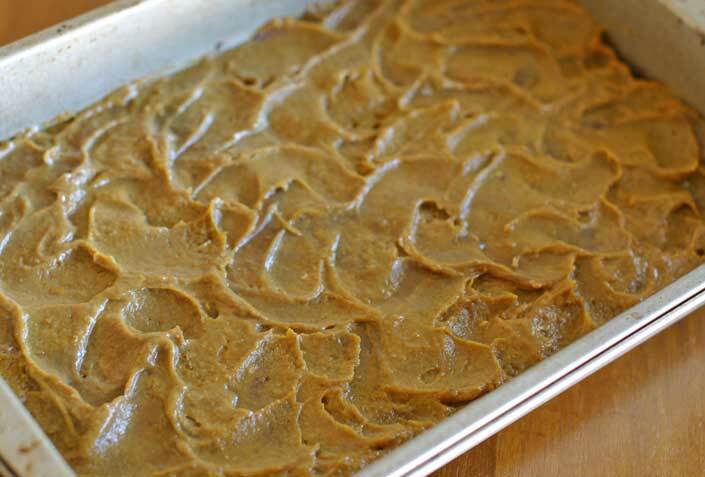 Distribute dollops of the pumpkin mixture over the top of the brownie layer at relatively even intervals. 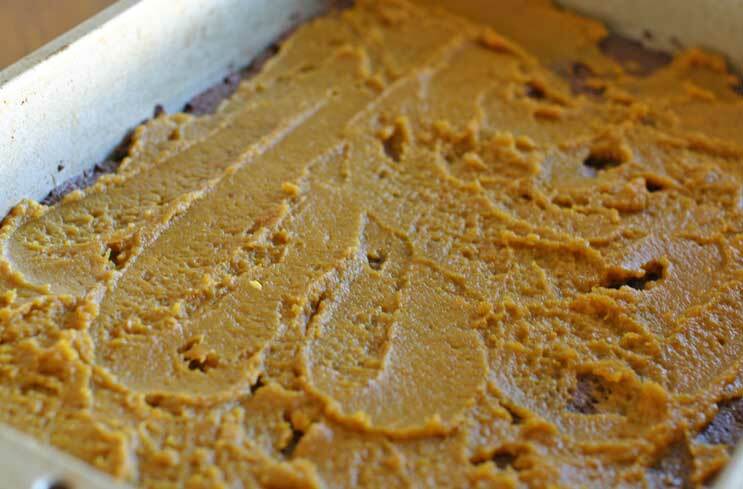 Using the back of your spoon, spread the pumpkin to cover the whole area, being careful not to disturb the brownie layer too much. 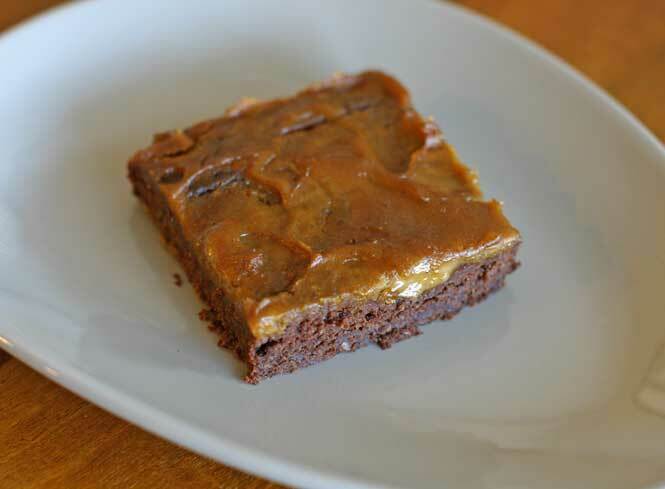 Next distribute small dollops of caramel at even intervals over the pumpkin layer. 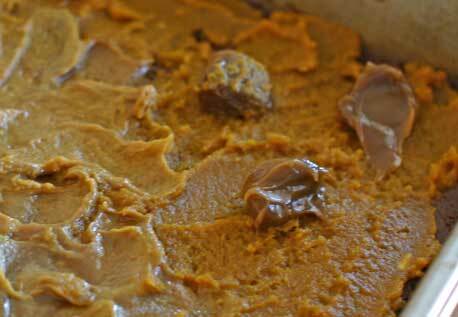 Once again using the back of your spoon, swirl the caramel into the pumpkin. 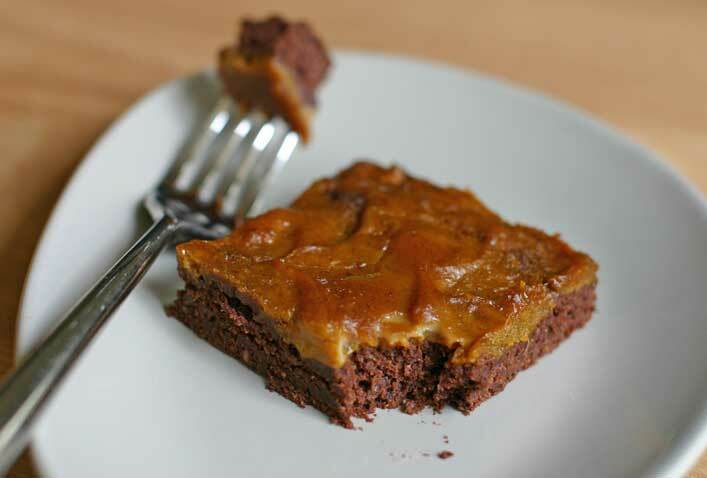 Make your topping swirl pretty, because it will bake like this and add to the visual appeal of your brownies. Slide them in the oven and bake for 20 minutes. Allow to cool before cutting and serving. Enjoy! Never miss a single recipe! See what I'm up to in the kitchen today!